There is a book in The Aldershot Library entitled "A Gazetteer of Brick and Tile Manufacturing sites in North East Hampshire" compiled by A. Wright in 1980. Text below is reproduced from the 2003 revised "A Gazetteer of Brick and Tile Manufacturing Sites in North East Hampshire" ©2003 A. Wright, with permission. It replaces the original text from Peggy Stroud as that referred to the 1980 edition. Known as Kemp's Brickworks (Cole) and probably largest of the local brickworks. Possibly also the first of two sites referred to as the Aldershot Brick and Tile Works or Aldershot Brick Works comprising 22 acres of land, which in 1881 was offered for sale by auction covering "the lease, goodwill, plant and machinery". The site reported to be "one mile south of Aldershot Railway Station", which would place it in Boxalls Lane. The 1912 map shows extensive buildings on a large site with 2 or 3 round kilns. The London Clay was laid in beds one meter deep with layers of sand 100mm thick between. The whole was passed through a pug-mill and the resultant mix used for both handmade and machine made bricks and also for tiles. Dark red brick found on site incorporates an indented 'K', also bright orange brick marked "AB&TCo". Kemp was a prominent builder in Aldershot who started in 1857 and was reported to have subsequently manufactured his own bricks from the London Clay beds. It is said he built St. Georges Church, Badshot Lea and many working class houses in Farnham. A press photo of 1927 showed workers at the Aldershot Brick and Tile Works, Boxalls Lane. In Kelly's 1931 Directory an entry referred to Aldershot Brick and Tile Works (The), (Executors of George Kemp), Elms Road, Aldershot, and later, in 1935 to Aldershot Brick and Tile company Limited, Boxalls Lane, Aldershot. Kelly's 1939 give it as Hampshire Brick Company Limited, Boxalls Lane. The site is being developed for housing under the name of Old Kilns. N. Cole 1951 The Story of Aldershot; Smith Ewbank 1971 Victorian Farnham Phillimore; Kelly's 1895, 1903, 1931; H.G Dines, F.H. Edmunds 1929 The Geology of the Country Around Aldershot and Guildford; Ian Hewitt 1998 Historic Rural Settlement in Hart and Rushmoor H.C.C. ; White W.C.F. 1971 A Gazetteer of Brick and Tile Works in Hampshire H.F.C. ; O.S. 1912 ed map. Mr. Roy Masters (Director of Kemp Stroud Builders, Aldershot) and his wife, have assembled historical material of Aldershot, with particular reference to the Kemp-Stroud business. It is possible they intend to write a record. They are likely to have useful history of the Kemp ownership of the Brick and Tile Works. - Old Kiln Field, Church Hill, owner in 1855 was Eggar. - Brick Kiln Field, Church Lane, owner in 1841 was James Elstone [Elston?]. - Kiln Field, Church Road, owner in 1841 was Richard Allden. For an Aldershot News article from March 1907 entitled "Trading Enterprise - Half a Century of Building" extolling the work of Mr. Kemp's firm, his work in Aldershot and the surrounding villages, see this page. From - "www.hants.gov.uk/hampshiretreasures/vol03/page207.html - "Kemp's Brickworks". Dates from the C.18 and probably the oldest and largest of several brickworks in the area. Large clay pit, 50 ft. deep - now being filled in. Ref: The Story of Aldershot, (Cole), p.294. (Parts of the Brickfields Country Park site was "filled in", or could this refer to the Grosvenor Road site which was also partially filled in?). SU 867 495, Card 0102 07.". There is a record of a birth for a Richard Allden in 1800 in the parish baptisms for Aldershot. 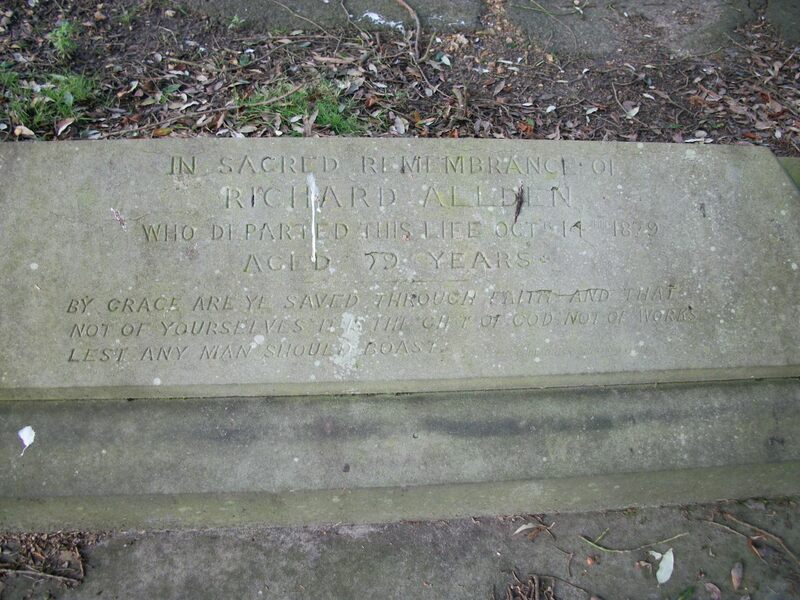 There is also a grave in the Redan Road cemetery Aldershot, for a Richard Allden who died on the 14th October 1879 aged 79 photo, so we presume this is the same person.